Earlier, I was not very fond of salads. The description of a salad was just chopping a few raw vegetables, some salad leaves & mixing with salt & pepper. It was boring & uninteresting until my whole perspective of a salad changed when I realized my husband enjoyed salads & gave me ideas to turn a plain salad into a master piece. 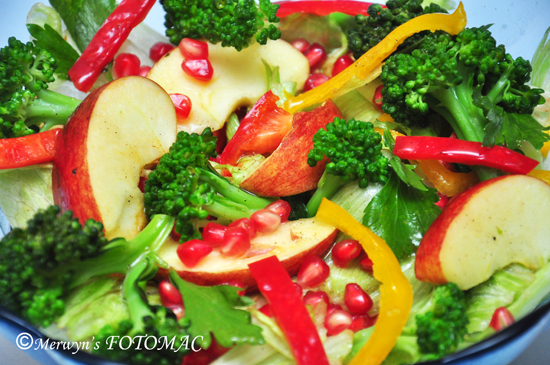 My attitude changed & I enjoyed inventing ways of making a simple salad into an appealing one. Fill sufficient water in the pan so as to cover the Broccoli. Wash the Broccoli & separate into florets. In boiling water, put in the broccoli & let it simmer for about 2 mins. Drain the broccoli & place it in chilled water for 2 mins. Drain. This is done to retain the fresh green colour of the broccoli. Use as desired. Place the ingredients of the Salad dressing in a bottle which has a wide mouth. Close the bottle tightly & shake vigorously till all the ingredients blend well. 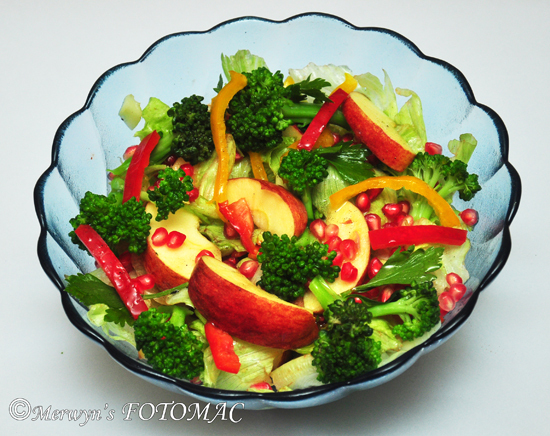 In a large bowl place the iceberg lettuce, broccoli, red & yellow bell peppers, apple & pomegranate. Pour the salad dressing, toss well & serve the salad fresh & crisp.